After you cross the stone bridge at the entrance, there is a shuttle bus station, where you need to pay an extra $20 yuan to use. Since the Tang Paradise is huge, I would suggest taking the shuttle bus to get around. They will pick you up and drop you off at designated spots, and you just need to show them your ticket to get on. 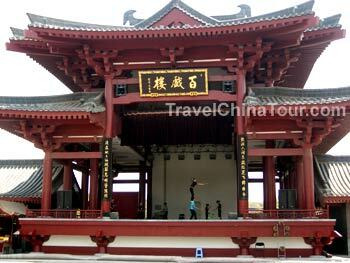 At many of the attractions in Tang Paradise, there are various performances. At my first stop, I was in time to view a Chinese acrobatic performance. The next stop was the Purple Cloud Tower (Ziyun Lou). The Purple Cloud Tower was built in 720AD. At that time, emperor Minghuang of the Tang Dynasty would always climb the building on the day of the Qujiang Fair. Note: this purple cloud tower is not the actual, historical building - this is a reconstructed building modeled after the real building. The Ziyun Tower is built in the center of the Tang Paradise based on descriptions of historical records, and it is the most important Tang Dynasty complex in the park. On the first floor of Purple Cloud tower are sculptures and mural paintings refelecting the prosperous Zhenguan period (627-649AD). 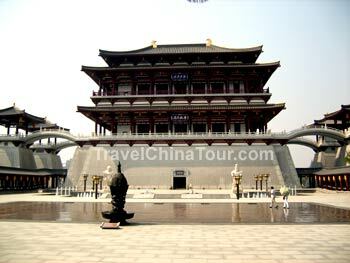 There is also a model of the Chang'an city of the Tang Dynasty, and there are also various cultural relics on display. The second floor displays some colorful sculptures depicting the scene of a royal banquet. On the third floor, is a performance room where visitors can enjoy daily singing and dancing performances from the Tang Dynasty period. 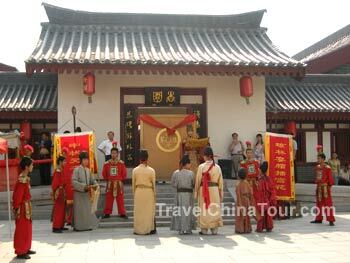 At many of the attractions, there are daily performances that depict various scenes and events from the Tang Dynasty. My last destination at the Tang Paradise is worth a special mention because of the performance held there. It was at an attraction named Apricot Garden. It received its name because there were many apricot trees during the Tang Dynasty, and it was a famous garden at that time where people came to appreciate the flowers on the trees. Apricot Garden was where successful candidates of the imperial examinations were given banquets to celebrate their success. This reconstructed Apricot Garden is modeled after the Tang style and covers an area of 2,134 square meters. When I arrived at the Apricot Garden, a performance was just about to start, which involved the audience. They were putting on a play about the imperial examinations, and re-creating the ceremonies that took place when the top finalists were selected. 5 male audiences were selected, and were given old style Chinese clothing costumes. The 5 participants were asked to perform several "tests" to determine the winner of the examinations, and the winner would receive the "royal" treatment with a parade in a carriage around the garden. The 5 participants were dressed in old style clothing and were ready to take their exams. 3 were adults, and 2 were young boys standing on the right side. 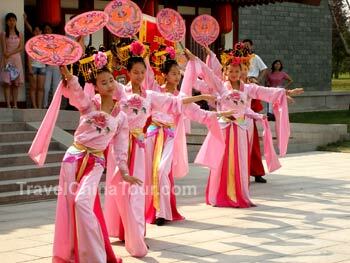 At the end of the "exams", a Tang style dance was performed by several dancers to congratulate the winners.